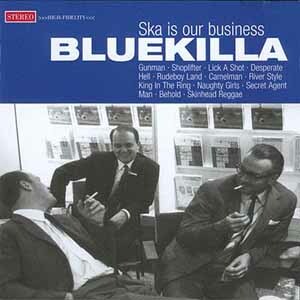 Following the 2 albums, various contributions to compilations and countless mega concerts, Bluekilla can surely be regarded as one of the most important German ska bands. SKA IS OUR BUSINESS, the title of the new album is well chosen, as these lads from Munich certainly master their handicraft. Every track emphasises that they know what style means. No matter whether 2-Tone, rocksteady or skinhead reggae, this band skilfully blends the original ingredients with a unique, distinct sound of their own. The result: an album that even puts the conservatively dressed gentlemen on the cover into a jovial party mood.